Did you know? Just because you’re at the top of Google in one country (e.g. google.co.uk), it doesn’t mean you’ll have the same position in another country (e.g. google.fr, .com…)! Even search results on google.com are personalised according to your location. 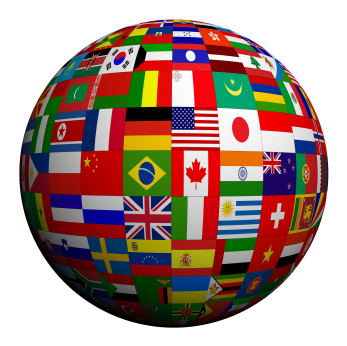 So, how can you get your site to rank well in different countries around the world? Perhaps you have 2 geographically different target markets? Here are some of the major factors that will affect your ranking. It’s great to have an awareness of the main points – it will enable you to have a better understanding on prioritising your online, and SEO spending. First up is your Domain Name. TLD (top level domain) is the extension that appears after your domain name - e.g. for www.mysite.com it is the ".com". Top Level Domains can be either specific to a geographic region or more general. General TLDs (such as .com, .net, .org...) are not tied to any geographic location or country. However, Country Code TLDs (ccTLD) are country specific (e.g. for the UK = .co.uk, for Russia = .ru, for Algeria = .dz). CcTLDs are better for ranking in a specific country - however they will rank less highly elsewhere. For example, if your website is www.mysite.ru, it is likely your site will rank much more highly in the Russian Google (www.google.ru) than the UK Google (www.google.ru). A ccTLD can be an important factor in your rankings in a specific country, for sure. However, creating individual websites for each country/ location you are present in may not be an efficient solution! Remember that .com is powerful not only in the US but also internationally in general. Next, your websites IP address will have an impact on your sites ranking. This depends on where your server (that hosts your website) is located. In short, if ranking in a specific country is important to you, you need to host your site on a server in that country. So if you're outsourcing your hosting, you need to make sure your provider is offering an IP address for each of your sites corresponding to the country you're targeting. As you might expect, next up is content - Google will consider not only the copy on the pages but also your page titles and meta descriptions. So you need to think about not only developing unique content for each local site (e.g. in the local language) but also all the content (e.g. page titles and descriptions). Don't forget that all important keyword analysis you did at the start of your site too - this is very much a localised process - and would need to be entirely repeated for each local website. Naturally, any content that also mentions a geographic location (e.g. your address) and for example your listing on Google places can also have an impact. Also worth consideration is your backlink profile. This means how many targeted backlinks your site has from relevant, high quality websites. This, and the text that the links come from (the anchor text) will not only boost your Pagerank (Google will see your website as being more important) but your site will also be ranking for the keywords in the anchor tect you used. In conclusion, there are lots of factors to consider when defining your online presence internationally - does the cost of SEO (and potentially the creation of new, local websites) outweigh the benefit? If indeed, your business is truly international, you might like to consider a .com domain (which can still rank well outside the US), with language specific sections. Want to know more? Just give us a call, we'd be happy to talk it over with you. This actually creates confusion to most search engine optimizers. Clearly, the domain has great impact on the geographical ranking of your page. A lot of SEO factors starts in the site creation. So it definitely has to be put into consideration.